The newly-elected elected office-bearers (see below) of the above-mentioned Association, do, in compliance with the original Statutes drawn up in Paris on 12th November 1991, and in compliance with the present Statutes, modified in Paris on 5th November 2007, agree to govern the administration of the Association henceforth in compliance with the law of 1st July 1901 and the decree dated 16th August 1901, under the name INTERNATIONAL CIVIL AVIATION ENGLISH ASSOCIATION. 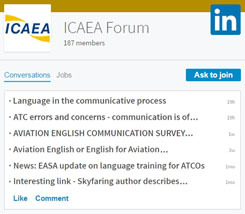 Promote the exchange and communication of information about the use of English between airline companies, civil aviation authorities, air navigation service providers, aircraft manufacturers and suppliers, civil and military pilots, air traffic controllers, aeronautical and aircraft engineers, aviation training centres, universities, colleges, research centres, teachers, human factors specialists, translators, journalists etc. Organise, where appropriate, teacher training and informational seminars. The seat of the Association is in Toulon, France. The Bureau of Office Bearers is empowered to decide the specific address. Note: The Association’s business address is in Luxembourg. The Association has an unlimited duration. Honorary members elected upon proposal by the Board, or two active members, and benefiting from a waiver for any standing membership fee. New active members may be admitted after approval by the Board, which at each of its Meetings decides upon the applications for admission submitted, ensuring that the applicant complies with the Association’s ethics. Or, any serious reason contravening the Association’s aims as stipulated in Article 2; its principles of impartiality, tolerance and mutual respect; its non-commercial nature; its ethical code of good practice; its internal regulations or the spirit of these. The Association may join any federation provided it be in compliance with the aims laid down in Article 2 of the present statutes. Any other source of income compatible with the aims of the Association and its non-profit-making character. Any membership fees are set annually by the Board at the General Meeting. The Board which governs the Association consists of a minimum of six (6) and a maximum of twenty-five (25) members, appointed for a period of three (3) years from among the active members of the Association. The Board meets at least once a year for the General Meeting upon being convened by its President, or at the request of a third of its members, with submission of an agenda and resolutions to be voted fifteen (15) days prior to the Meeting. Decisions are taken by a majority of votes of those present or represented. Minutes are taken of the Meeting. Board meetings and deliberations may also be attended by Board members having observer status. These members will not take part in any voting or elections. For a duration of three (3) years. The General Secretary and Treasurer may also have the status of Vice President. These members may be re-elected. In the event of vacancies, the Board decides provisionally on the replacement of the Bureau’s members. Their definitive replacement is decided by the next General Meeting. The powers of the replacement members normally expire at the expiry date of the members they are replacing. The Board is entitled to appoint other active or individual members for specific assignments. Members thus appointed are not entitled to vote during Board Meetings. The Ordinary General Meeting comprises all the appointed Board members and meets once a year. Other active, individual or collective members may attend it in an advisory capacity. Members shall be convened at least fifteen (15) days before the date set by the Secretary or the General Secretary, or in his/her absence, by another member of the Bureau. The agenda is stipulated on the summons. The President, assisted by the members of the Board, chairs the Meeting and presents the condition of the Association. The Treasurer reports on his/her management and submits the budget to the Meeting for approval. The General Meeting also deals with any specific issues on the agenda and which are part of the Association’s activity. Once the agenda has been covered, members of the Board are replaced, if required. Any decisions are taken by a majority vote of Board members present or represented. Each member present cannot represent more than two (2) absent members by means of written proxy. The quorum is set at 50% of the Board members, including at least three (3) members of the Bureau. In the event of the quorum not being met, the General Secretary must convene a new Meeting within fifteen (15) days at which decisions will be taken by the majority of votes cast. In the event of deadlock, the President will have the casting vote. The proceedings of the Board are recorded by the General Secretary in a register and signed by him/herself and the President. The General Secretary can deliver copies that he/she certifies to be authentic. If necessary, or at the request of a simple majority of Board members, the President can convene an Extraordinary General Meeting in compliance with the provisions of Article 12. Any modifications to the present statutes of the Association shall be submitted to the members of the Board thirty (30) days before the General Meeting and requires a decision taken with a majority of two-thirds of the Board members present or represented gathered in an Extraordinary General Meeting. By-laws in the English language may be drawn up by the Board that has approved them by the General Meeting. These by-laws are designed to decide certain points not covered by the Statutes, especially involving the internal running of the Association. In the event of a dissolution decided by two-thirds of the Board members present or represented at the General Meeting, or by legal decision, one (1) or more receivers are appointed in compliance with Article 9 of the law dated 1st July 1901 and the decree dated 16th August 1901. The Tribunal that has authority in any action involving the Association is that where its seat is located.